The thump of my dad’s standard 350cc Royal Enfield Bullet is among my earliest, oldest living memories. Yes, the Bullet is from a generation before mine, so it is old. And you can’t teach an old dog or horse new tricks, they say, but one can sure strum a brand new tune on an old beat-up banjo. Royal Enfield sure seems to be in tune with this homily and has upped the ante in the Bullet reliability and efficiency contexts. 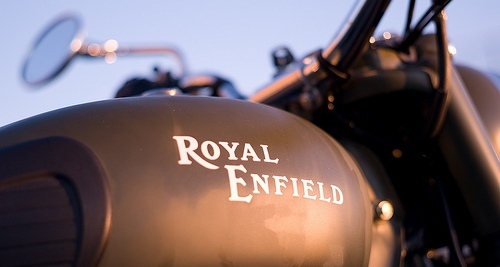 With its cult status and flourishing exports, Royal Enfield cannot afford to ignore international emission standards. The Royal Enfield R&D team was handed brief to improve performance, reliability and efficiency without sacrificing any of the bike’s signature character. Voila, the result is the new Thunderbird Twinspark, equipped with an all-new unit construction engine that integrates gearbox in the crankcase itself, in place of the separate unit in the Bullets of yore. This must rate as milestone in Bullet annals as the engine had remained virtually unchanged except for the AVL designed lean burn head. The new engine features twin spark plugs for efficient air-fuel mix combustion. Given that the placement of plugs does not infringe on existing patents and is in a different segment altogether, REML officials expect no controversy. A revised piston and piston ring design reduces the blow-by, the latter being thin and flexible to reduce friction along with hydraulic tappets. The camshaft is equipped with roller followers to reduce friction further. The new design automatically eliminates losses due to friction while providing higher breathing volume. Lower pressure inside the engine meanwhile averts oil leaks. The engine is now fed through a Ucal BS29 carb with bigger venturi size. It also gets revised ignition timing and Throttle Positioning Sensor (TPS) now coupled to the existing TCI (Thyristor Controlled Ignition). The result is a flatter torque curve and 10 per cent increase in maximum power and torque figures. The sprag clutch assembly is now incorporated in the crankcase, against the externally mounted unit on the earlier bike and is far more reliable. The engine also gets an automatic decompressor that ensures no-sweat kick-starting if electric starter is kaput. The automatic chain tensioner takes care of chain slack. The cam gears have a high contact ratio for better tooth contact, reducing bottom-end clatter. The rudimentary spindle arrangement has been replaced by a trochoid oil pump for efficient lubrication. With boost in overall efficiency, fuel efficiency is claimed to have improved by ten per cent alongside cleaner emissions. Thumb the electric starter and the new engine emits a signature Bullet thump. The light clutch is a veritable boon for left hand and gearshifts are unbelievably smooth. False neutrals however ensure rider remains in Bullet zone. Better power and torque claims translate into faster throttle response - and the Thunderbird feels quicker. The speedo needle gets to 100kmph in a jiffy, while top speed I hit on the Chennai-Pondicherry East Coast road was a reassuring 120kmph. The new engine revs far more willingly and remains vibration-free right up to 5500rpm, a revelation in Bullet context. The flatter torque curve ensures effortless pull from as low as 1500rpm in táop gear. Our test bikes came equipped with the older short muffler silencers but the production bikes will sport the earlier long bazooka lookalikes that feel a bit constraining, for obvious emission reducing chores. Cosmetically nothing has changed except for the Twinspark badging on the body panels. The chassis also remains the same and endows the bike with great straightline abilities. The bike corners well though familiarity with the tall handlebars is advisable before taking the plunge. 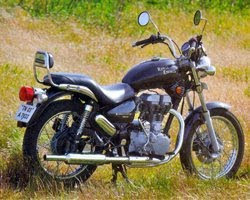 The Thunderbird was the first bike in India to sport gas-filled shock absorbers and boasts an excellent ride over broken surfaces, the perfect off-road tool. The true blue cruiser now gets potent halogen lamps and powerful magneto for brighter beam in the dark. Bullets sporting the new engine are already export market bound. The twin spark Thunderbird has been introduced in the domestic market. If it elicits positive response, the engine could be seen on the entire Bullet range. A key model to be launched in Europe in November could be India-bound as well. The Thunderbird Twinspark replaces the current ‘bird and will retail at roughly the same price. The bike is currently available in Chennai and Bangalore only but after production ramp-up, will be launched countrywide.